Cognitive Engineering: Are high-impact events necessarily rare? It seems fortuitous that high-impact events are rare. 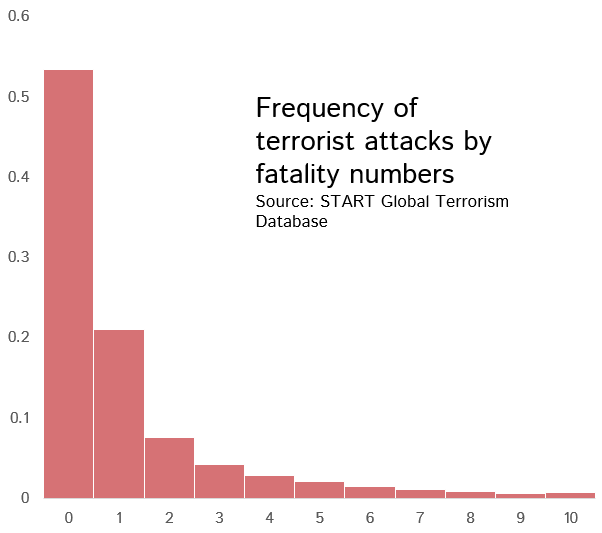 Over half of all terrorist attacks kill no-one, one in five kill one person, and attacks that kills tens or hundreds of people are vanishingly rare. 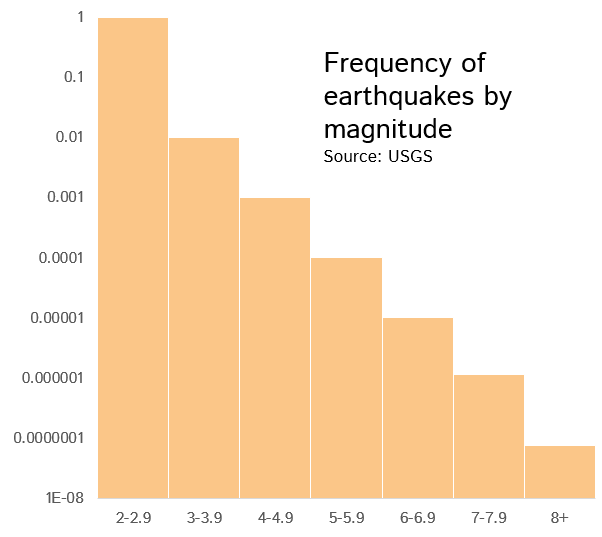 Earthquakes increase in frequency by a factor of about ten with every point decrease in magnitude. The same sort of distribution applies to meteors, floods, solar activity and so on. Many event categories are distributed in an exponential or power-law distribution with regard to impact. Is it just luck that we live in a world where high-impact events are rare? Here are three possible reasons why high-impact events might be necessarily low-probability. The first relates to the processes whereby impacts are generated. Events that are exponentially distributed are often generated by processes which have a constant probability of becoming larger, or though a process of sequential division. All 2km-long rivers started out as 1km-long rivers, but not all 1km-long rivers become 2km-long rivers. Terrorist attacks that kill 10 people need to start by being terrorist attacks that kill 1 person, but not all of those kill any more than that. Starting from the other end, meteors break into several smaller ones (source: Asteroids) and so if there is a sufficiently high percentage chance of breakage, there will be lots of grain-of-sand-sized meteors for every one large one. This has a superficial plausibility, but the problem is that a number of other event types - particularly those generated through additive processes - do not come in one-tailed distributions like this. Daily temperature, for example, is normally distributed and (thankfully) does not therefore have a large peak at 0 degrees Kelvin; the same goes for rainfall, sizes of predators, and severity of heart attacks. Why are there no distributions of this kind producing frequent high-impact events? One reason might be habituation. In other words, 'impact' might be defined implictly or explicitly around a baseline of 'normality'. If terrorist attacks that killed 100 people happened every day, this theory goes, we'd no longer see them as an extreme event. So it's not the high impact that drives low probability, but low probability which drives the perception of higher impact. Another possible and related reason is adaptation. Evolution adapts organisms for survival within their environment, so we tend to evolve 'immunity' to frequent events. If large floods were commonplace, perhaps we would be better swimmers, or able to breathe underwater, like intertidal dwellers such as barnacles. One interesting feature of this quite-fundamental question is how hard it is to structure a way of answering it. How might we test hypotheses purporting to explain why high-impact events are low-frequency?